The US president is in the Philippines with leaders of 18 other nations for two days of summits, the final leg of a headline-grabbing Asian tour dominated by the North Korean nuclear crisis. Donald Trump and Rodrigo Duterte held a bilateral meeting at the ASEAN Summit in Manila. 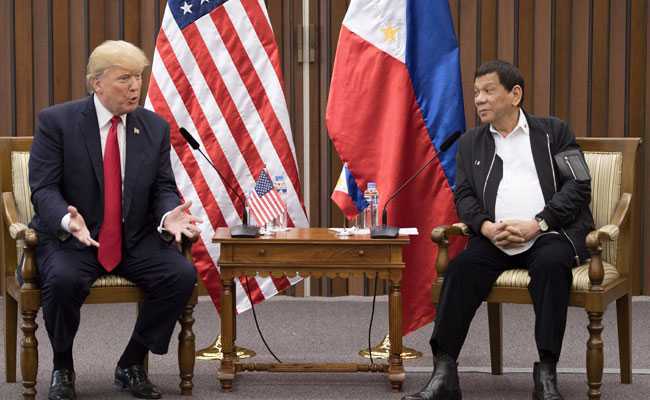 Donald Trump declared Monday he had a "great relationship" with Philippine President Rodrigo Duterte, a self-proclaimed killer who is waging a drugs war that rights groups say involves mass murder, as the leaders joked with each other in Manila. Allegations of Russian meddling in last year's US presidential elections have dogged the second half of his 12-day trip, which has taken him from Japan to South Korea, China and Vietnam. Rights groups had called on Trump to end his Asian journey with a strong statement against Duterte's drugs war, which has seen police and suspected vigilantes kill thousands of people. But Trump and Duterte had a series of encounters on Sunday night and Monday morning in which they appeared to enjoy each others' company, leading to warm praise from the US president during official talks at lunchtime. "We've had a great relationship. This has been very successful," Trump told Duterte in brief opening remarks at their meeting. Trump praised Duterte for his organisation of the summits, saying he handled them "beautifully". "I've really enjoyed being here," he said. As the reporters were being escorted out of the room, one asked if Trump would raise the issue of human rights, to which Duterte jokingly called the media "spies". Both laughed but and neither answered. Duterte's spokesman later said repeatedly that Trump did not raise any human rights concerns in the meeting, which lasted about 40 minutes. However Trump spokeswoman Sarah Huckabee Sanders said human rights was raised, although "briefly". Duterte won elections last year after promising to eradicate illegal drugs with an unprecedented campaign that would see up to 100,000 people killed. Since he took office, police have reported killing 3,967 people in the crackdown. Another 2,290 people have been murdered in drug-related crimes, while thousands of other deaths remain unsolved, according to government data. Many Filipinos back Duterte, believing he is taking necessary measures to fight crime, but rights groups warn he may be orchestrating a crime against humanity. Amnesty International accuses police of shooting dead defenceless people and paying assassins to murder addicts. When pressured over allegations of extra-judicial killings carried out by police, Duterte insists he has never told them to break the law. But rights groups say police are following Duterte's incitements to kill, including comments made last year when he said he would be "happy to slaughter" three million addicts. He has also repeatedly boasted about killing people himself, most recently last week while in Vietnam for the Asia-Pacific economic summit. "At the age of 16, I already killed someone. A real person, a rumble, a stabbing. I was just 16 years old. It was just over a look," Duterte said. Former US president Barack Obama was one of many prominent critics of Duterte's handling of the drugs war. The Philippine leader responded last year by calling him a "son of a whore". Relations between the Philippines and the United States, longtime allies bound by a mutual defence treaty, deteriorated sharply as Duterte turned towards China and Russia. Duterte last year declared the Philippines' "separation" from the United States. But Trump told Duterte in a telephone call in April that he was doing a "great job", which helped to begin a diplomatic thaw. "We are your ally. We are an important ally," Duterte said on Monday, appearing to confirm relations were back on track, although he has also continued to court China and Russia. Some Filipinos were not happy though, with hundreds of people staging an anti-Trump rally near the conference venue which led riot police to use water cannon. Duterte and Trump sat next to each other at a pre-summit banquet on Sunday, during which they smiled, chatted and clinked champagne glasses. Duterte, 72, also sang a Filipino love song, saying light-heartedly that he did so on the orders of the US president. Duterte is hosting the world leaders because the Philippines holds the rotating chair of the 10-nation Association of Southeast Asian Nations (ASEAN) bloc. The events on Monday and Tuesday in Manila are two separate ASEAN-hosted summits, which also include China, Japan, Russia, South Korea, India, Canada, Australia and New Zealand. The rising threat of the Islamic State group across Southeast Asia, and further efforts to pressure North Korean leader Kim Jong-Un to abandon his nuclear ambitions, were top agenda items in Manila. "Terrorism and violent extremism endanger the peace, stability and security of our region because these threats know no boundaries," Duterte said in an opening ceremony speech on Monday.